As a food blogger, someone who loves learning new things and basically a lover of good food, I have an ever-growing list of 'Recipes to try' and 'food I'd love to learn how to make'. And that list grows like it has a life of its own. Just the other day, my husband, in all innocence asked me what I would do when I ran out of recipes to share on the blog. My response - I laughed. He thought I'd lost it. Then I showed him just a glimpse of these lists and he knew it wasn't going to happen any time soon. Today's recipe is one I've wanted to try even before I'd started any of these lists. You see, Dal Vadas are easily available street food in Bombay. These aren't as popular as Idlis and Medhu Vadas (South Indian Food), but I've always had a soft corner for this treat. These deep fried dumplings are made from split and hulled chickpeas aka Chana Dal, easily found in any Indian grocery store in the aisle with the lentils. They are everything I love in a snack, small portion size, crispy on the outside and chock full of flavor. 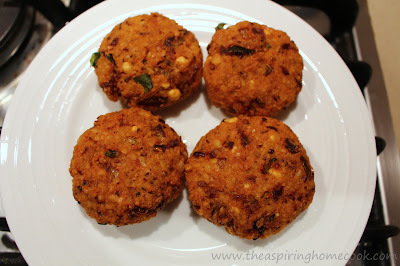 The recipe I tried is a little different from the commonly found Dal Vada. It is amped up with some Garam Masala (an Indian spice blend) and fennel seeds, which you typically don't find in the Street Food variety, I must admit it adds a lot of flavor. You could skip the fennel for a more tradition version of the vada. I couldn't believe how easy it was to make. You could serve this with your favorite chutneys like this Green Mint Chutney (Pudiney ki chutney) and this Tamarind and Date Chutney (Imli ki chutney), or you could just serve it with some Tomato Ketchup. Or be like me, throw caution to the wind and serve it up with all three for a little variety. Whichever way you decide to go, I hope you try it out. Wash the chana dal a couple of times and drain the water. Soak the dal in fresh water for an hour and a half. Make sure there is ample water in the bowl. after soaking drain the dal thoroughly using a colander. Grind the cinnamon, red chillies, cumin and fennel to a coarse powder. Keep this aside along with 2 tbsp of the chana dal. Grind the rest of the drained dal and salt by using the 'Pulse' function on your blender to grind it coarsely and transfer to a bowl. To the bowl, add the curry leaves, onion, coarsely ground spices, green chillies and the reserved dal and mix it all well. To shape the vadas, roll a golf ball size of the mix to a ball and flatten them. Drain and place on some kitchen paper to absorb any excess oil. Serve hot with either chutney or ketchup. Enjoy hot with a steaming cup of tea !!! Click here for some more Bombay Street Food options. I go through phases like that all the time. I can't wait to see your Japanese food creations.